As long as I can remember art in various forms has always been a passion of mine. Ever since I was very young I learned alongside my father, who was an artist and teacher of color and design at an art college, as he painted on the beach. Much to my disillusionment however, he declared he was not going to spend his hard-earned money on my plans to enroll in art college to become a starving artist. Instead I attended a Conservatorium of Music and Dance in The Netherlands and became a “starving” dancer. Needless to say, a change of occupation was warranted, although I did continue to teach dance for a good number of years, In addition, my career path as well as raising my four children has kept me quite occupied for a number of years, and it wasn’t until later in life when the kids were grown that I re-channeled my energy into art. 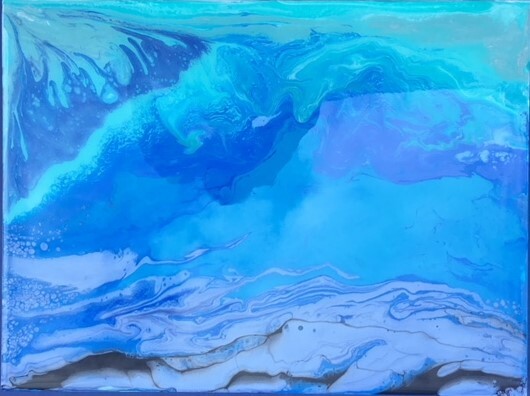 Like a kid in a candy store I experimented with various media from textile to stained glass, to water colors, acrylics, and now acrylic pouring and resin art. Life and art are adventures, ever evolving and growing …. For me life has become full circle as my talented 6-year-old granddaughter Riely paints right alongside of me. There is nothing we rather do together! I could not be more moved or proud! In addition to painting with Riely, my favorite time passing includes anything in and on the water, spending time with my dog Lucky, hang-gliding with my grandson Gabriel, and visiting my wee little grandchildren. Always drawn to the ocean and the beaches I divide my time between Ocracoke, NC and Big Pine Key, FL. 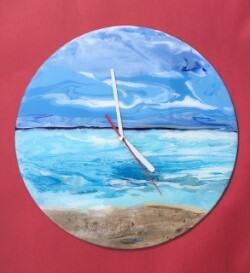 You can see my work at the Artists in Paradise Gallery or on Facebook (Art by Ingeborg) while my website artbyingeborg.com is under construction. I welcome commission pieces and would enjoy teaching small workshops or classes. I particularly would enjoy working with special needs groups.